With the Holidays are wrapping up so are Courtney and I on our 2012 Holiday Gift Guide. I hope you enjoy the last few reviews and giveaways we will be bringing you!! One thing that I love is getting clothes for myself but it is also the one thing that hardly ever gets bought. As most mom's do I put my children's needs in front of my own and do without. So needless to say I was super excited when Courtney and I got the opportunity to team up with Fresh Produce. I got to review their Long Sleeve Vintage Drape T in black. This shirt has quickly become a favorite of mine. I love how soft it is and that it is not to form fitting instead very flattering. I love that I will still be able to wear it if I become pregnant anytime soon. I do however wish the material was a little thicker so the top wouldn't be see through. I always wear one of my long sleeveless sweaters overtop of this top and they look so nice paired together. Unfortunately since I am the one who is always behind the camera there have not been any pictures of me wearing this wonderful top. I always remember I need to get a picture as I am throwing it the washer to be washed. I love that this top is made of 100% cotton and made in the USA. I would love to get a couple more of these tops in different colors so I don't wear my one out to quickly. I would also like to try this top in their tank version as well. 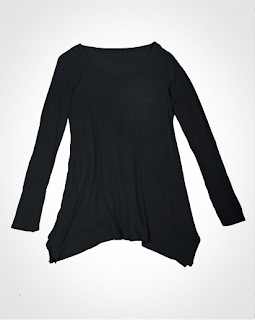 I love the uneven hem lines on shirts and I also love shirts that are very flattering like this one is when on. Not all styles of clothing can work on every body shape and size but this is one top that would work for all body shapes and sizes and still look very flattering. oh wow!!! I bet that shirt is super comfy! I love the looks of it and I also love that the edges aren't even! Looks fabulous! Thanks for sharing! I'll take a look at their site! I love Fresh Produce. I'm with you, their shirts are super comfy. That one looks like it would be nice to relax around the house in! I was just telling my hubby that I need some new clothes... I am going to head over and take a peek around the site. Thanks for the info! I absolutely adore Fresh Produce clothes and the prices are great too! This shirt looks like just my style too! A must have piece! I love Fresh Produce! I have one of their dresses and wear it all the time. Definitely love this top as well.